The Providence Friars head to Carnesecca Arena to take on the St. John's Red Storm on Thursday, December 28, 2017. The opening line for this matchup has St. John's as 7 point favorites. Providence comes into this game with an overall record of 9-4. They currently have a point differential of 5.4 as they are averaging 75.6 points per game while giving up 70.2 per contest. St. John's has an overall record of 10-2. They are averaging 74.3 points per game and surrendering 62.8, good for a point differential of 11.4. 12/22/17 G Alpha Diallo Ankle is "?" 12/22/17 G Kyron Cartwright Ankle is "?" 12/22/17 G Maliek White Knee is "?" 12/20/17 G Marcus LoVett Ankle is "?" Rodney Bullock averages 16.8 points per contest while playing 33.1 minutes per night this year. He grabs 6.7 rebounds per contest and distributes 1.2 assists per game. His FG percentage is 40% while his free throw percentage is 72%. Alpha Diallo averages 10.3 points per contest in 24.7 minutes per game this year. He averages 1.4 assists per game and 4.9 rebounds per contest. His field goal percentage is 54% for the season while his free throw percentage is 75%. Shamorie Ponds scores 20.4 points per contest while playing 35.7 minutes per game this season. He hauls in 6.3 rebounds per contest and has 4.8 assists per game on the season. His FG percentage is 40% and his free throw percentage is at 87%. Bashir Ahmed averages 11.3 points per game this year and he sees the court an average of 26.6 minutes per game. He also brings in 4.9 rebounds per game and has 0.8 assists per contest. His field goal percentage is 38% and his free throw percentage is 60%. 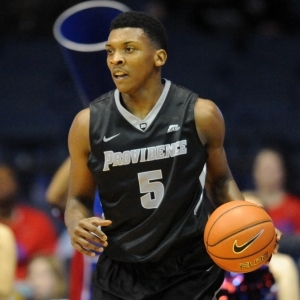 Providence averages 75.6 points per contest this year, which is 166th in the nation. Their average scoring margin is 5.4 and their shooting percentage is 46% as a unit, which has them ranked 116th. From 3-point territory they shoot 40%, which is good for 41st in Division 1. They average 36.0 boards per contest and 14.2 assists per game, which ranks them 192nd and 168th in those offensive categories. In the turnover department they are 162nd with 13.8 per game. The Friars allow 70.2 points per contest, which is 137th in the country. They also surrender a 43% shooting percentage and a 31% average from 3-point range, ranking them 154th and 45th in defensive field goal percentage. Opponents average 35.8 rebounds a game which ranks 219th, and they allow 11.5 assists per game which puts them in 63rd place in college basketball. They force 15.1 turnovers per game which ranks them 246th in D-1. St. John's is 199th in the country with 74.3 points per contest this season. They are 294th in the nation in shooting at 42%, while their average scoring margin is 11.4. They shoot 32% from beyond the arc, which is good for 278th in Division 1. They are 123rd in the country in rebounding with 37.6 boards per contest and 260th in assists per game with 12.8. The Red Storm are 268th in turnovers per contest with 12.4. The Red Storm give up 62.8 points per game, which ranks them 23rd in the nation. Their defense surrenders a 37% shooting percentage and a 31% average from behind the 3-point line, ranking them 9th and 59th in those defensive statistics. They rank 46th with 11.0 dimes allowed per game and 315th with 39.5 boards surrendered per contest. The Red Storm are 345th in college basketball in forcing turnovers with 19.3 per contest this year. The Friars are 147th in the nation in offensive rating with 106.5, and their defensive rating of 98.9 is ranked 149th. In terms of pace they are 208th in the country with 70.3 possessions per 40 minutes, and their effective field goal percentage of 53% is 140th. As a team they are 159th in college basketball in true shooting percentage with 55% and they shoot 3-pointers on 31% of their shots, ranking 305th in Division 1. Providence is 149th in turnovers, as they turn the ball over an average of 16.8 times per 100 possessions while forcing 18.4 on the defensive end. Their defensive effective field goal percentage for the season currently is 49%, which is 132nd in the nation. St. John's is 292nd in the country in turnovers, as they turn the ball over an average of 14.8 times per 100 possessions while forcing 22.9 on defense. Their defensive eFG% for the year currently is 44%, which is 24th in Division 1. The Red Storm are 11th in the nation in defensive rating with 86.7, and their offensive rating of 102.4 is ranked 225th. They are 107th in D-1 in pace with 72.5 possessions per 40 minutes, and their eFG% of 48% is 300th. As a unit they are 276th in college basketball in true shooting percentage with 52% and they shoot 3-pointers on 35% of their shot attempts, ranking 237th in the country. Who will win tonight's Providence/St. John's college basketball game against the spread?